Less than a year and a half ago, Happy Death Day jolted the Halloween season awake with its unexpectedly entertaining and genuinely suspenseful twist on Groundhog Day, where a sorority girl continuously lives out the same day in which she's stalked and killed by someone wearing a baby mask. The amusement factor runs high due to both the time-based humor and the brutal methods in which she keeps dying at the hand of this Ghostface-inspired predator, yet the ways in which the original ties into her birthday, family, and personal growth also give it a meaningful streak. And like the Bill Murray vehicle that so clearly inspired it, no explanation was given or needed for how she got caught in the time loop; in fact, the seemingly mystical enigmas of her predicament played into the emotional tempo. The sequel, Happy Death Day 2U, doesn't appreciate this: it's a sequel that relies on tearing down mysteries in order to hijack characters and recreate the cyclical suspense, making both lesser films when viewed together. Fans of Happy Death Day should have fond memories of Phi Vu's character: the bleached-blonde Asian guy whose vulgar statement gets repeated over and over, getting all sorts of reactions and interruptions from Tree (Jessica Rothe), our focal sorority girl, as he stumbles into a shared dorm room. The sequel begins from his perspective as he's awakened while sleeping in his car (which really does look like it smells like Hot Pockets and feet), after which he has an eventful day of accidents, surprises, and the delivery of tough news about his scientific research project. Later, he gets stabbed by someone dressed in a familiar baby mask and black clothes, which leads to him reliving the same day over again. Wandering into his dorm room as Tree and her now-boyfriend-ish Carter (Israel Broussard) are making out, he divulges to them the nature of this weirdness, which naturally puts Tree -- who just recently escaped from her own time loop -- on edge. By helping him and discovering the source of the loops, Tree again gets drawn into a chronological nightmare. Now, I'm not usually in favor of storytelling elements being chalked up to "magic", but doing so really worked to Happy Death Day's advantage, even on a deeper, semi-philosophical level. As soon as quantum physics and an experimental reality-warping device enter the picture in Happy Death Day 2U, these facets are systematically stripped away by co-writers Christopher Landon and Scott Lobdell from the universe they've created, in a misguided effort to pull Tree back into the chronological chaos and … heavy sigh … to realistically describe how and why it all happened in the first place. Just on the surface, this frontloads the sequel with passable supporting characters, a messy attempt to set up the notion of multiple universes/dimensions, and, quite frankly, some feeble attempts at mounting suspense around the Babyface Killer's return. In the original, Tree sought out -- by violent trial and error -- the right chain of events that stop her killer, whereas this sequel chases a fix to the scientific cause of it all. Blah. There are less complicated, more viscerally suspenseful ways in which Tree could've been forced back into the loop(s) for a sequel, and the sloppiness of how it's established here -- a villainous and fickle dean of students (Steve Zissis) who abruptly endangers the research project; an inconsistent alt-reality version of sorority queen Danielle (Rachel Matthews); lots of monotonous equations -- drain the suspense from Happy Death Day 2U. As soon as Jessica Rothe recaptures the camera's focus, however, it's as if a switch gets flipped that immediately refocuses one's attention back onto the dizzying world extending from the original, with her character bravely charging into obstacles as the weatherworn, charismatic heroine she's become. It's easy to hate on how Tree gets pulled back into this mess, but the vivacity in how Rothe's character mentally and emotionally processes the differences between timelines almost justifies it, even when she goes through with some questionable trial-and-error plans. Most of the missteps in Happy Death Day 2U boil down to a lack of understanding of how to be a horror movie alongside its other objectives, drawing too much inspiration from Back to the Future -- yes, it's referenced by name -- without remembering to directly unsettle the audience every once in a while. By presenting the idea that Tree could exist in multiple universes, the screenplay also creates the possibility that the killer from the first movie isn't necessarily the killer in the sequel, which does introduce the opportunity for Christopher Landon and Scott Lobdell to create new suspects, fates for the various characters, and a few red herrings. They get so caught up in the "multiverse" and narrowing down these variables that they neglect the buildup of suspense over revealing who's behind the mask this time. While it's a trip to see stuff like Tree lifting middle fingers in a bikini while falling and splatting to her fate, and then promptly getting resurrected, the context lacks suspense and smacks of obligation to repeat strategies that work in the original. From recognizable camera angles and referential dialogue to the emotional choice at the heart of the story, Happy Death Day 2U can't be accused of avoiding the first film or attempting to stand alone, relishing all the ways it recalls details both large and small from Tree's first encounter with "the loop". It's worth applauding how Landon and Lobdell have written around the character's internal turmoil -- both physical and psychological -- and how that bleeds into this sequel, because the scenario surrounding our heroine certainly wants to rationalize the technobabble used to explain away what was once perceived as a divine occurrence, a la Groundhog Day, in the first film. 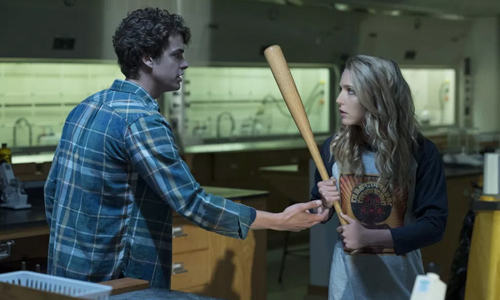 Much like what happens to Tree throughout this new franchise, however, too much abuse gets unleashed upon the concept for Happy Death Day 2U to remain standing by its end, and it's due to Landon and Lobdell making the fundamental mistake of trying to explain what's best left unexplained. Mario Bava is a master of extracting substance from within his style, where the moving parts of emotions and motivations oftentimes lead to deeper horror experiences than one might expect. Whether he's lurking in the heavy shadows of black-and-white gothic tales or operating with vivid pools of colored lights from across the spectrum, his direction -- and influence over the camerawork -- conscientiously focuses upon the characters in such a way that even some of the smallest, seemingly inconsequential characters have a little something else going on beneath the surface. In a murder mystery like Blood and Black Lace, this feeds into credible uncertainty as to who's responsible for killings. 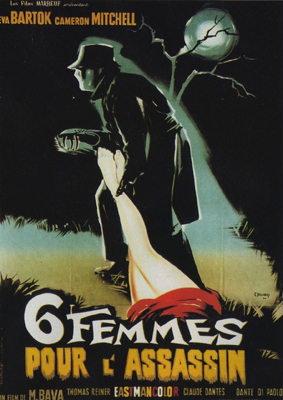 Taking place mostly within a modeling-slash-burlesque "fashion house", Bava's lavish prismatic shades and sequence of gruesome death take shape as one of the earliest and most influential manifestations of the Italian giallo horror subgenre, clutching firmly onto the traits of those who come in and out of the house for its emphatic whodunit suspense. Dressed in a jacket, hat, and stretchy face wrap to conceal their identity, someone lurking on the grounds of the fashion house viciously murders one of the many models who resides there. An investigation into the murder begins, and with the inspection into the motivations of those close to the victim also comes the discovery of a wide array of other wrongdoings from the residents, largely contained within a specific diary. 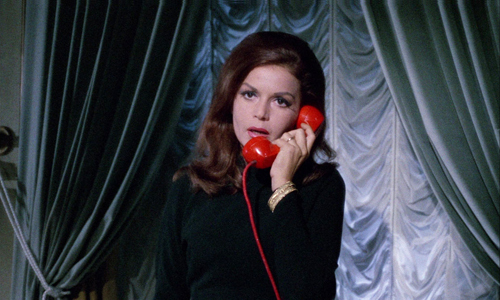 While the recently widowed manager of the company, Christina (Eva Bartok), attempts to maintain the status quo and keep the fashion business moving, the location of the diary becomes its own mystery as the killer remains at large, eventually claiming other victims with ties to the fashion house … and to that secret diary. Suspects are narrowed and motivations come and go, but the threat of the killer continues to loom throughout, with many of the personalities that pass through the fashion house becoming more and more distinct. Immediately, the bright colors and moody shadows of Maria Bava's craftsmanship take control in Blood and Black Lace, almost as if looking at the fashion house through a kaleidoscope while he slyly introduces the actors, all draped in various hues while Ubaldo Terzano's camerawork flows from one to the next. Crimson mannequins with shiny black hair also peek out from the darkness, elevating Bava's setting into something bordering on the surreal as models finalize their garments and bodies are discovered in hiding places. This is a display of artifice, sure, but what's on the surface ties together with the orchestration of the fashion shows themselves, as well as to those who participate in them. Searching for symbolism in every shade of color in Blood and Black Lace may be futile, but it's hard to dispute the calculation involved with how Bava selected the right ones to create specific moods, emboldening his purposeful use of colored lights that seem unnaturally emergent in the house. Things that'd come across as ostentatious elsewhere feel at home and meaningful in this palace of superficiality. It doesn't take long for Blood and Black Lace to demonstrate that there's more going on here than just a bunch of pretty women being killed off by a random stranger. From the deaths emerge suspicions and gossip, which introduce all sorts of indiscretions committed by both the models and those that manage them, spanning from hedonistic behavior to more serious offenses like secretive abortions and blackmail. That's where the giallo mechanisms kick into gear, in which the ominous killer gets overshadowed by the wide range of people who could feasible lurk under the mask, and the motivations behind their killing. While these characters wouldn't be classified as profound, exactly -- this isn't a rich moral examination or anything -- almost all of them have a compelling underlying layer that hinges on some deeper human flaw, which makes going the guesswork on who's responsible for the murders an interesting experience in observation. The intersection of details going on about who's wrapped up in what drama, and where the tell-all diary might've ended up, continuously raises the tension throughout. While the likes of Black Christmas and Halloween shaped the slasher-movie framework into the machine for tension that we've come to relish, Blood and Black Lace telegraphs a similarly methodical, thematic sequence of deaths, aptly earning a reputation for being a precursor for conventional bodycount horror. The deaths can be grueling, hinged on the tortures of impalement and scorched flesh, but they're designed less for the suspense of seeing whether someone's going to die and more on expanding the mystery behind who's responsible. Bava skillfully ties together the process of eliminating suspects from a list of possibilities with stylized, unrestrained kills full of the spirit of Italian horror, with set design choices that amplify the mood just enough to draw attention to the intensity of their demise. Attention has also been paid to the manner in which everyone's been killed by the masked murderer, creating a situation where almost anyone -- male or female, strong or borderline weak -- could feasibly be underneath the disguise, motivated by any number of potential revelations about their wrongdoings. The reveal of who's behind the mask and the reasons for their killing spree isn't terribly surprising in Blood and Black Lace, but that's more of a testament to the foreshadowing and setup devised by Bava and screenwriter Marcello Fondato than an absence of shock value or potency. It could be argued that the framing of certain clues and dialogue early on might've been a little too suggestive for their own good, building to a predictable finish; however, when it comes to the revelations about the victims and how they factor into the masked murderer's reasons for their villainy, these pieces fit together into an outcome that simply make sense in its operatic grandness. While it isn't as gruesome as Black Sunday or as intent on building to visceral scares as Black Sabbath, Blood and Black Lace drops into a devious middle-ground between the two while remaining focused on credibility with its murder-mystery rationale, stitching together equal measures of Bava's emphasis on style as substance and straightforward, yet sharply-written pulpy thrills. 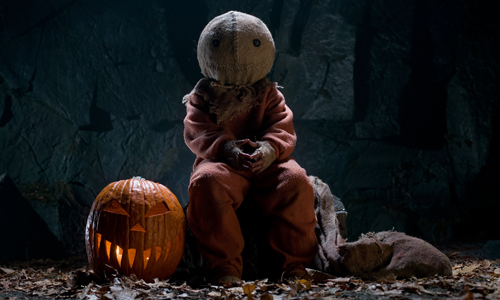 Over the course of a decade since its limited theatrical showings and surge of popularity on home video, Trick 'r Treat has developed a reputation for being a quintessential film to watch over Halloween … or Samhain, or All Hallow's Eve; take your pick. It's tough to imagine a film capturing the many facets of the holiday's spirit quite so thoroughly, from the spooked-out observations of kids braving the dangers of the night for their candy to the adults pursuing other kinds of, uh, more mature "treats" while donning their own costumes. Closer in purpose to A Christmas Story than the likes of Halloween or Hocus Pocus, Michael Dougherty's freshman feature ties inextricably to the holiday's customs, atmosphere, urban legends and other moving parts, to such a degree that it makes it difficult to imagine watching Trick 'r Treat at other times of the year. As a mood-setter, you're not likely to find one that's more immersive and character-focused while conjuring the season's spirit; however, when looked at as a straight horror anthology outside the season, it's not exactly the most frightening of the pack. Trick 'r Treat spins campfire tales centered on several loosely connected people throughout a small American town on Halloween, one that's decked out for the holiday season and puts on a parade-slash-party in its main downtown area. For the most part, the stories don't intersect with one another until the plot designs for them to do so, which gives the individual portions their own standalone "short story" properties. In some instances, Trick 'r Treat sticks to practical, real world horror impacted by urban legends; in others, the writing delves into the supernatural world of transforming beasts and creatures risen from the dead for the stage that it's setting. A uniting element comes in the presence of a young child wearing a burlap sack and orange jumpsuit who observes many of the activities going on throughout the evening, and it's no surprise that this kid, named "Sam", has become an iconic character among fans of the film, wielding one very dangerous sucker in his own pursuit of tricks and treats. From tampered-with candy and the ritual of leaving lights on throughout the night to the possibility of real vampires and ghosts lurking underneath the costumes of both youngsters and adults, Trick 'r Treat clearly gets and adores the dark mixture of danger, merriment, and folklore that hallmarks Halloween. The world Michael Dougherty constructed acts like a crossroads between John Carpenter and Tobe Hooper movies: a small-town meeting place where both reality and the supernatural can coexist for an evening, which is pretty much what makes the holiday such a blast. By tilting it toward an R-rating, Dougherty can also spill a bit of blood and let the natural language of teens and young adults flow freely without catering to that broad "family-friendly" audience, arriving at that mildly macabre, vulgar point that's just taboo enough to ward of youngsters but not so gratuitous that older-leaning families can't enjoy the grossness and crassness involved. The atmosphere in Trick 'r Treat, photographed by Glen MacPherson with the orange blow of jack-o-lanterns in mind, feels the way that Halloween should. Each of the five segments are structured like spooky stories that'd be told over a flashlight or campfire, too. Part of the enjoyment factor with Trick 'r Treat comes in seeing how the tales spring their surprises upon the audience with what true dangers lie underneath whatever story's being told, a dynamic that has both rewarding and adverse effects on the film's general pacing. The anticipation of arriving at each one's climax generates enough grin-inducing suspense to stay wrapped up in what's going on, yet Dougherty's efforts to conceal details and preserve the "scares" for the very end of the episodic tales -- especially in the segment featuring Dylan Baker as a murderous school principal and single father -- results in moody, comical, somewhat macabre leadups that are mostly devoid of genuine shocks. Dougherty has a great time with lightheartedness, double meanings and fakeouts that make this a morbidly satisfying viewing experience, and clever practical and digital effects keep Trick 'r Treat firmly locked into a horror atmosphere … but, up until the endings, they telegraph chills and gross-outs instead of genuine fright. Does Trick 'r Treat need to be that scary, though? After all, there's strength in Dougherty's characterization of both the town and its inhabitants; living vicariously through them as they experience the eerie idiosyncrasies of the holiday transforms into its own novel experience, one propelled by the almost comic-book caliber vividness of them all. Through his connection with the filmmakers involved with the X-Men franchise, Dougherty roped in some bigger-than-expected names to embody key characters: Anna Paquin brings her familiarly reserved, yet passionate demeanor to her role as a college-aged virgin hunting for "the one" to get it out of her system; Brian Cox wheezes his way through a depressed, Jack Russell-owning drunkard who torments trick-or-treaters. Most of the child actors do a bang-up job of representing the pranksters, tagalongs, and victims of the evening, all of whom get involved in how the film lashes out, almost in karmic fashion, at those who disrespect the intentions and balance of the holiday. Their reactions to the night's surprises fill the void left by the absence of traditional scares. While the stories may be separate from one another, the execution of the setting and the transitions between the segments result in Trick 'r Treat having the appearance of a cohesive narrative, which adds impact whenever those stories manage to bump into one another during the evening's activities. Dougherty doesn't try to shoehorn links between them all in some attempt at greater importance, leaving them as tangential connections and novelties that only serve to elevate the impact of Halloween itself, all overseen by the ominous yet nondescript Sam as an avatar and keeper, of sorts. 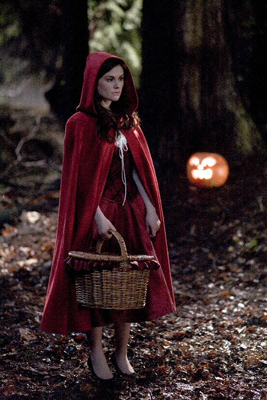 Bits-‘n-pieces of the film could feasibly work outside the confines of the Halloween setting -- notably, the segment featuring the escapades of Anna Paquin's Red Riding Hood-dressed virgin and whom ends up pursuing her -- but so much of Trick 'r Treat relies on inextricable ties to holiday that those who aren't big fans of those specific rituals and customs might not have enough horror substance into which they can sink their teeth. Dougherty lets his ode to Halloween be itself, though, and that's why it's such a treat.